Teeth are vitally important to your pet - dogs and cats are not big fans of gumming their kibbles into submission. In order to properly chew and digest their food, dogs and cats need to keep their teeth and gums healthy and strong. Not only can it be painful, but infected and inflamed teeth can be the launch pad for diseases elsewhere in the body. When you go into the dental aisle at your local pet retailer, you're faced with a whole host of choices. Toys, specially-designed treats, and dental appliances like toothbrushes and dental wipes are all vying for you attention - and your dollar. So which of these are worth the effort, and which are just hype? Before you are faced with the decision on what products to choose for your pet's oral health, you should take one preparatory planning step: visit your veterinarian. They can make a thorough assessment of your pet's dental health and come up with a plan to get the teeth clean and healthy - which usually involves a dental cleaning done under anesthesia (dogs and cats won't sit still while they get their teeth cleaned like we do). For complex dental cases and dental reconstruction, veterinary dentists (specialist veterinarians who only work on teeth) can be your best ally - and your vet can set up a referral if needed. Daily tooth brushing after the cleaning, just like for you, will also help keep them pearly white. Once you have the teeth clean, you're ready to wander the aisles of the pet superstores and pick out some products that will help your pet's teeth stay clean and healthy. First, look for the VOHC seal of approval. The VOHC is a council of trained veterinary tooth experts (doctors and nurses) who evaluate products and help find the good ones - the ones with some science behind them. And the good folks of the VOHC don't have a dog (or cat) in this fight - they must sign a conflict of interest statement and stay neutral about the products that they endorse. VOHC approval means that your dog or cat stands a better chance of keeping their teeth when you use these products as directed. As they say on their website: "Regular use of products carrying the VOHC Seal will reduce the severity of periodontal disease in pets." Dental treats are food-based items that are designed to scrape tartar off teeth while chewed. Tartar is a gooey accumulation of bacteria and food that can stick to teeth and lead to infection and inflammation - gingivitis. While the dogs and cats chew, the treat acts like a toothbrush to physically (in some cases chemically, or enzymatically) remove the buildup of tartar from the teeth before it can become mineralized (it then becomes plaque, which is even more prone to damage teeth. It's like a little coral reef growing in your pet's mouth). I'm not a big fan of bones - sure, they'll scrape off tartar, but they break teeth like crazy, too! And a broken tooth that exposes the pulp (living part inside the tooth) is one sure way to get a tooth root abscess - which is painful, expensive and can lead to more severe problems. Rawhides are a mixed bag - some dogs love them, and if you get US made rawhide, they are generally safe. After they get chewed on, they are usually soft enough to swallow and digest. Avoid foreign-made rawhides as they can contain some nasty chemicals that you don't want your dog coming into contact with. I have seen plenty of rawhides cause problems - they can get stuck in the esophagus or intestine and cause a problem. Make sure to watch your dog, and if they are trying to swallow a really big piece, better to switch to a different treat. Is it labeled with VOHC approval? Is it size appropriate? Don't give your teacup poodle Great Dane treats. Check the weight and breed suggestions on the package. Is it firm but not hard? They'll scrape better without damaging teeth or gums. Stay away from bones. Is it too cheap? If they seem too good to be true, they probably are (I'm looking at you, dollar stores). Similar to dental treats, dental toys are meant to be chewed on and keep teeth health and tartar free. The difference is they're usually made of rubber, plastic, or other synthetic material and are not meant to be ingested. Sure, ingestion of small amounts is part of the fun of chewing on them, but that's not the main focus. Dental toys usually last longer than treats; I've seen my dog keep a good quality dental toy around for weeks. Make sure that when the toy gets whittled down small enough to be swallowed, it gets replaced with a new one. I have surgically taken several chew toys out of dog's intestines when they become stuck; that's an easily avoidable and expensive problem. Is it size appropriate? Check the weight and breed suggestions on the package. Does it have textures like nubbins and bumps that will massage gums and scrape teeth? Is it durable? Avoid bones and cloth toys; they're easily chewed up and ingested. Is it too cheap or foreign made? 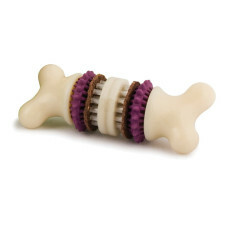 Dogs love to chew, and the right toy or treat can help satisfy their natural urge, while maintain good oral health. In partnership with your veterinarian (or if needed, a veterinary dentist), proper toys and treats can keep your pet smiling for many years to come! Brrrr! Does My Pet Need a Sweater?